This is one of our most unique hen party activity ideas! Why not try this for the ultimate hen do experience to remember! Even Gary Lineker has joined us to try our husky trekking adventure, featured on the BBC One’s Northern Exposure! After issue of safety gear and a quick brief, you will be harnessed into your husky kart, ready to go. Your team of husky dogs will take you through some of the most scenic mountain trails in Ireland. Enjoy this wonderful experience with your fellow hens and get a few photos along the route to show off to friends and family when you get back from your hen party! Qualified dog handlers will be conducting your trek. 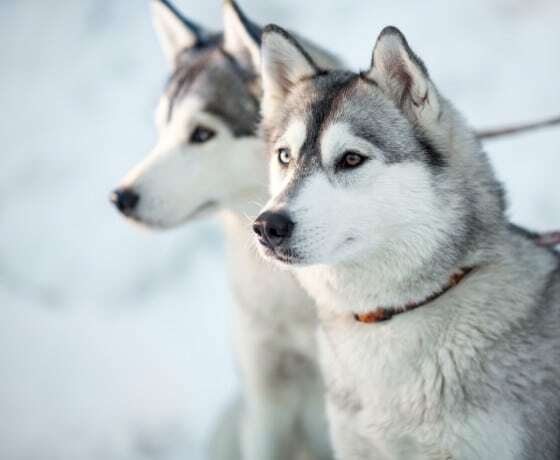 Their Husky Dogs are good-natured and well-trained. Warm, comfortable clothes and footwear are advised in case of bad weather. Please also bring a waterproof coat. For more information on Husky Dogs and Sledding, please visit our main Husky Trekking page. Want more Hen Party Ideas? Please check out our LAND, WATER and AIR activities!